A number of weeks ago, Stepan Sarpaneva used Instagram to announce a new in-house movement (aka ‘Moonment’) to mark his fifteen year anniversary. Formally launched at Baselworld 2018, the latest incarnation of his Mr Moon is a moon phase complication that is precise for an astonishing 14,000 years. Not only this, but he also comes in a hitherto unseen form – optical fibre. 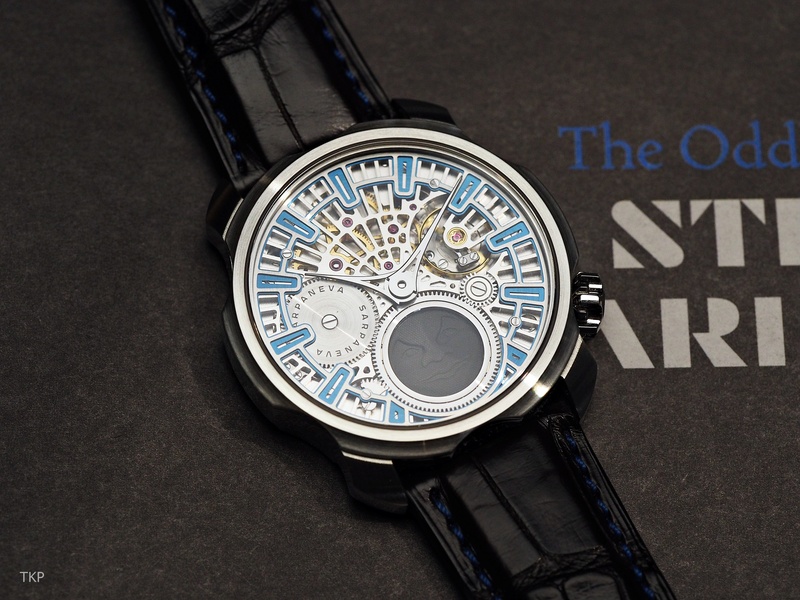 The accuracy of this new partially skeletonised movement is in large part due to the fact that the moon phase disc is the same diametre of the movement. As for the visual aspect, there are two rotating moon discs which appear behind the fibre moon, casting the requisite shadow. It looks quite dark in these photos, but if it’s lit from behind, it is almost transparent. One excellent piece of news about this new watch is that the moon phase function can be calibrated for either the Northern or Southern Hemispheres. The new movement is manual-wind, and has a fifty-seven hour power reserve. The watch comes in the Korona case, made of Finnish steel, with a size of 42mm and thickness of 10.4mm. Sarpaneva’s distinctive moon has come in a number of forms and sizes over the years, and this latest one provides yet another new type of interest, not just because of the unusual choice of material, but also because of how different it looks under different lighting conditions. The watch enthusiast who took these photos and let me use them commented that it’s a very cool thing indeed. Unfortunately, because these photos are of a prototype that was shown at Baselworld 2018, there are no rear shots at this point, so I cannot tell you about how the final watch will look other than saying that there will be something to aid moon phase calculations. For your own Moonment, made for your hemisphere, it will cost you 33,500 EUR (without taxes).